The Live Love Recycle project provides Beirut’s citizens with a free, on-demand service to pick up recyclables. It was set up after Lebanon’s eight-month waste management crisis in 2015, which saw massive protests. LEBANON • Wearing a helmet, elbow and knee pads, his yellow security jacket reflecting the sun that has come out after a rainy afternoon, Mr Ibrahim Habach rides his e-bike through the Beirut traffic. 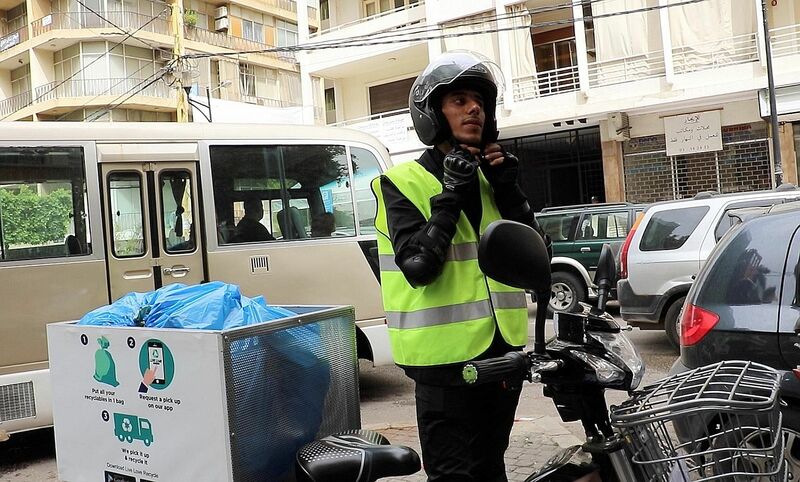 Mr Ibrahim, 23, is one of 400 collectors of the Live Love Recycle project, which provides Beirut's citizens with a free, on-demand service picking up recyclables. It was set up after Lebanon's eight-month waste management crisis in 2015, which saw massive protests from citizens. "Thousands of people protested against the trash crisis. It was a very understandable reaction. But at Live Love we do not like to complain; we prefer action. It runs in our blood," said founder Georges Bitar, 30, a member of Live Love Lebanon, an NGO that supports the environment and communities. Launched last April, the initiative is more than welcome in the Lebanese capital, where waste is thrown away unsorted in plastic bags, before ending up in coastal landfills and then probably the Mediterranean Sea, or else burned in the streets. To avail the service, users must download the Live Love Recycle mobile app. Two clicks and 90 minutes later, an e-bike courier arrives at their doorsteps to pick up their recyclable waste and deliver it to another NGO for proper disposal. All 400 of Live Love Recycle's e-bike couriers are Syrian refugees, and the project also employs around 20 women from vulnerable communities to prepare meals for the team members. "Providing hundreds of job opportunities to women and people from vulnerable communities makes Live Love Recycle a 100 per cent social initiative," said Mr Bitar. French NGO ACTED is a partner, while the United Nations World Food Programme funds and supports the project.